Lady Chang’O lives upon the Moon and shines Her beneficial energies down upon us. Everything that is the Moon is also Lady Chang’O and She is often called “Woman on the Moon”. Lady Chang’O reaches down to gather the Earth in Her loving embrace, inspiring devoted relationships, purity, growth and manifestation. Lady Chang’O began Her solitary life upon the Moon when She drank the elixir of immortality that was meant for Her husband Yi the Archer, God of the Sun. She did become immortal but something went wrong and She floated up into the sky landing on the Moon. When Yi discovered what Chang’O had done, He went to the Moon to visit Her, instead of being angry with Chang’O, Yi decided that She was meant to be the Goddess of the Moon, the perfect counterpart to His role of Sun God. Chang’O represents the source of yin, the female principle, as Her husband symbolizes yang, the masculine. Yi built Her a palace of cinnamon-wood and precious stones, and is said to visit Her on the fifteenth day of each month, when the Moon is full. 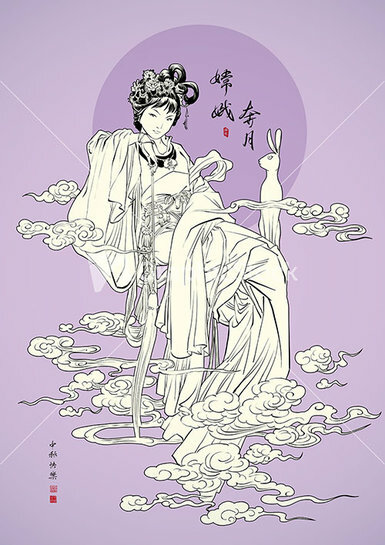 During the remainder of the lunar month Her only companions are a three-legged toad (who represents the three phases of the Moon) and the rabbit-in-the-Moon who continues to pound out the elixir of immortality in his mortar and pestle. Honor Lady Chang’O during the September Full Moon, and She will grant your secret wishes. Light a stick of incense and whisper your hidden desires to the Lady and you will be blessed with Her wisdom. The autumn harvest Moon is considered Chang’O’s birthday and is the perfect time to honor Her. Spend time outdoors gazing at the Moon, basking in Her silvery glow and She will be sure to spark your creativity. Set up a Moon Altar facing the Moon, light silvery candles and pray to the Chang’O. You may exchange moon-gifts that represent the Moon, and eat moon-shaped cookies or cakes, grapefruit slices or any other food that is evocative of the Moon. Family reunions and tree planting are also favored activities for Chang’O’s birthday Moon.